Until Chris Pearson developed the Sequent Repatterning Therapy for misophonia, hypnotherapy had been broadly ineffective or had provided only short-term relief. Misophonia has generally been treated as a phobia by hypnotherapists. Because of the physical reflex of misophonia, it has been impossible for individuals with misophonia to ignore or not respond to trigger stimuli. Actually, as discussed earlier, the misophonic person is responding to the combination of the sound and the physical sensation caused by the physical reflex. We can ignore sounds, but we cannot ignore the physical jolt or sensation of the reflex. 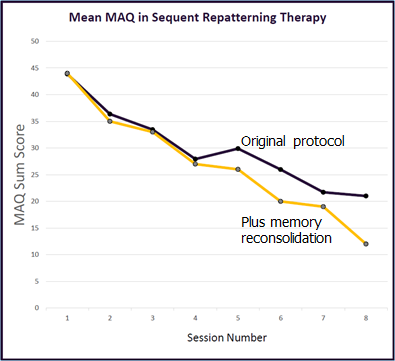 Sequent Repattering Therapy (SRT) is generally effective because it allows a person to feel the physical sensation of the misophonic reflex while not having the emotional response. The context of a physical sensation can have a great effect on the emotional response. If a nurse in the doctor’s office sticks you with a needle, you can stay completely calm. But if a person walks up to you and sticks you with a straight pin, then we can almost guarantee that you will have a strong emotional response. SRT builds a strong calming response over a series of sessions and then teaches the patient to respond to the physical sensation with the calming response rather than anger. 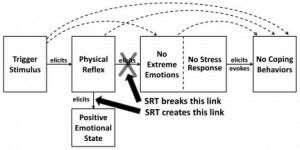 As shown below, SRT disconnects the emotional response from the physical reflex and creates a positive emotional response to the physical reflex. The SRT treatment is a series of five treatment steps that usually require up to eight hypnotherapy sessions. Steps one, two, and three build the emotional stability and strength of the individual, and develops a calm reflex. Step four disconnects the emotional misophonic response from the physical reflex and replaces it with the calm reflex. Because almost all misophonic individuals have the same physical reflex for all of their triggers, this step reduces the emotional response for all triggers. Step five of the process works to disconnect the physical reflex from the trigger stimulus. This step requires addressing each trigger individually. In 2013, Chris Pearson treated fifteen patients using SRT. Patients reported their misophonia severity score from one to ten as a “Subjective Units of Distress” (SUD), with one being non-existent to ten being very severe. Nine had a large reduction in the severity of their misophonia; rating one to three after treatment. Four patients had moderate improvement, with a SUD rating of four to six after treatment (and at least a three point reduction). One person dropped out of treatment and another did not respond to the treatment. In May, 2015, follow-up data was obtained on eleven of the thirteen individuals who responded to treatment. Of these, six had maintained their improvement, four had a decline but still had meaningful improvement, and one with moderate improvement had relapsed. Each had been asked to perform a daily calming exercise several times a day, which took less than a minute each time. Of those doing the daily calming exercise, five of six were maintaining the improvement and one had a decline in improvement. 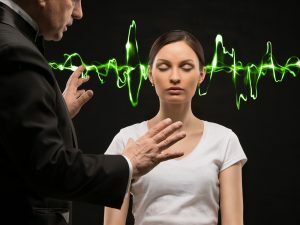 A major effort is underway by Chris Pearson and the Misophonia Treatment Institute to develop an SRT training program for hypnotherapists so this treatment can be more widely available. As of this writing, we have trained our first SRT hypnotherapists. SRT treatment can be provided by internet video-chat, so SRT is an option for anyone with a good internet connection. We are at an early phase of developing this treatment, but the results of the individuals treated in 2013 make us hopeful that this treatment may provide meaningful improvement to many individuals with misophonia. So far we have not identified any limitations for the applicability of SRT hypnotherapy treatment for misophonia. It has been used to successfully treat individuals as young as ten years of age. Successful SRT treatment can be accomplished by completing the first four of five steps. This disconnects the miso-emotional response from the physical reflex. A small percentage of individuals respond to the final step of SRT treatment and actually stop having the physical reflex response to triggers. Still, reducing the misophonic severity from moderate to mild or severe to mild is a significant positive benefit for anyone with misophonia. I believe that we can accomplish even further improvement by combining the SRT treatment with other treatment techniques, such as the Neural Repatterning Technique or muscle relaxation, which work to reduce the physical reflex response to triggers.